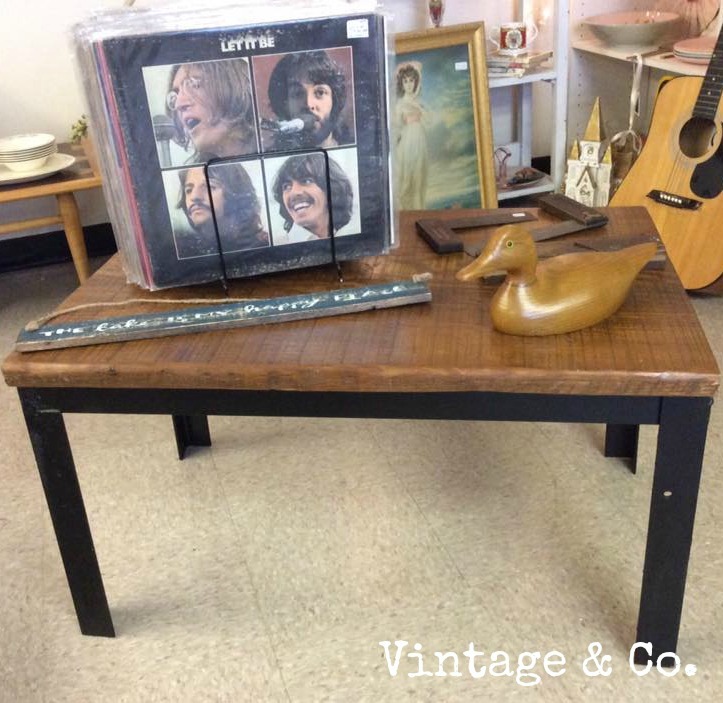 Welcome to Vintage & Co! 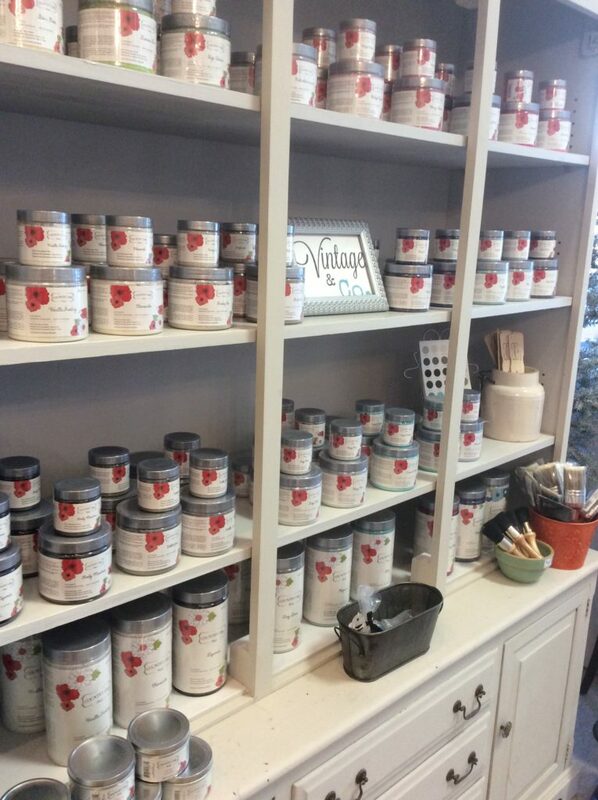 Looking for a great furniture and home décor paint? You will absolutely LOVE Country Chic Paint! 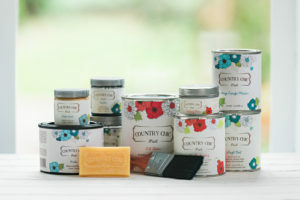 We are Lancaster’s ONLY Country Chic Paint Retailer! on the “Contact Us” icon in the top menu. Here is some of our latest inventory! 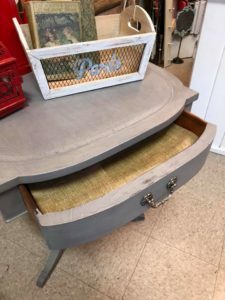 We took a vintage desk that needed some love and painted it with Country Chic Paint in “Cobblestone.” I love the “Industrial” vibe that it has! 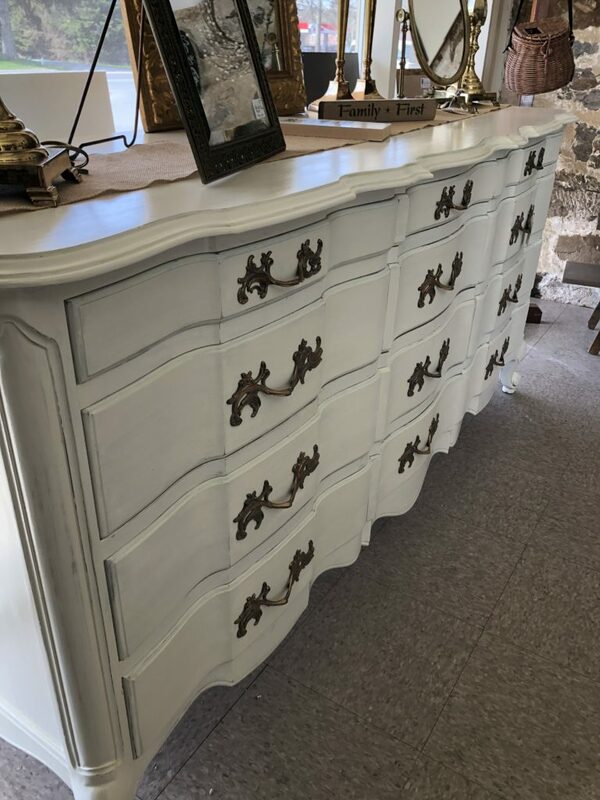 The existing drawer pulls were updated by giving them a coating of a metallic cream called “Trigger” by Country Chic Paint. 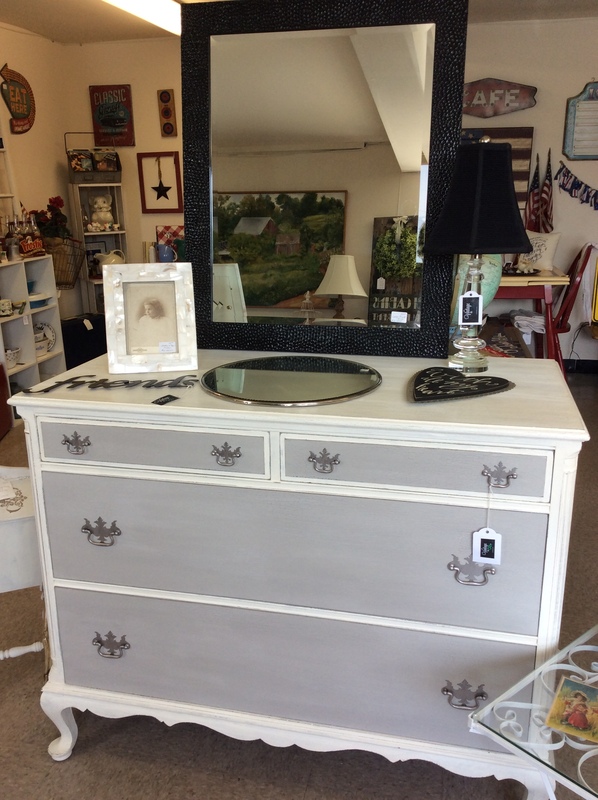 We added this beautifully painted dresser which has a look of the old vintage Wedgwood designs. 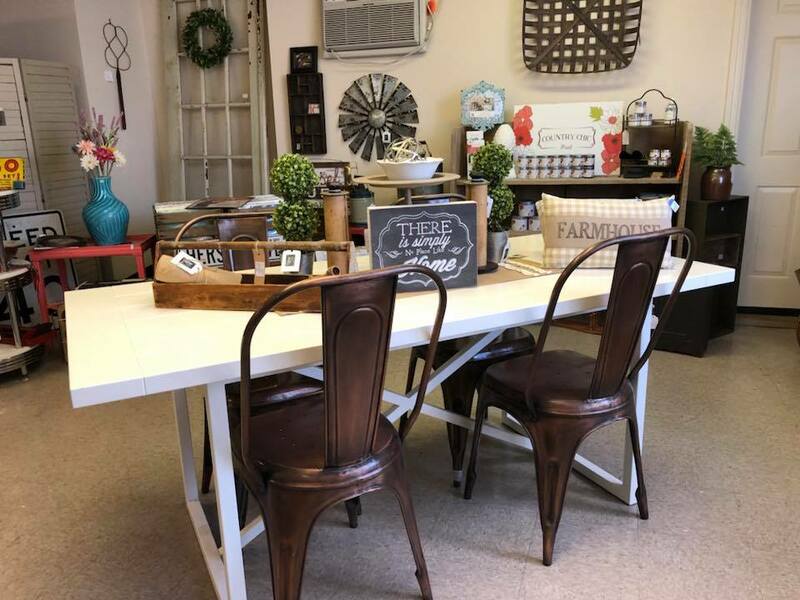 We just love our latest farmhouse table! painting the lower portion with Country Chic Paint in Simplicity. The six nickel silver / iron chairs compliment the set perfectly! Two additional leaves can be added for a total space of over 8 ft! 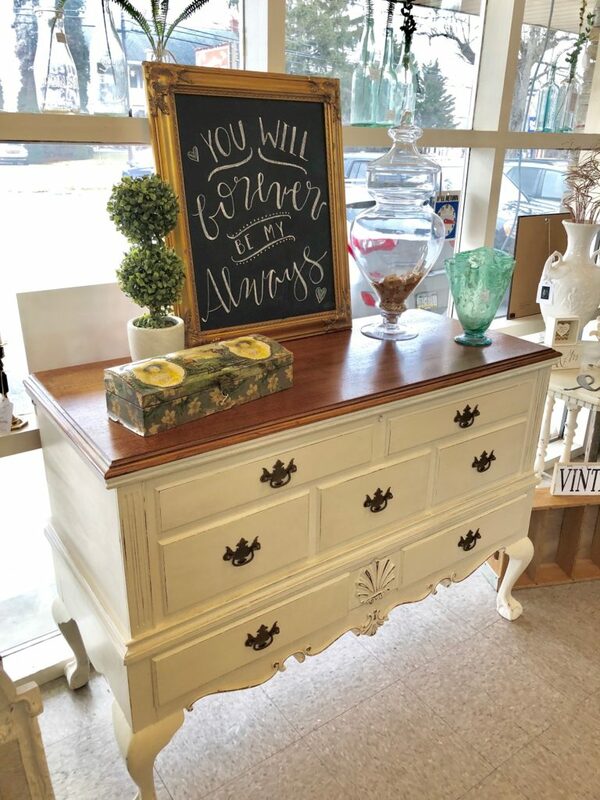 We are sooooo excited about this French Provincial dresser! there are several pieces that match for a complete bed room set! Stay tuned or stop in the shop to see the rest! A pop of red always catches my attention! 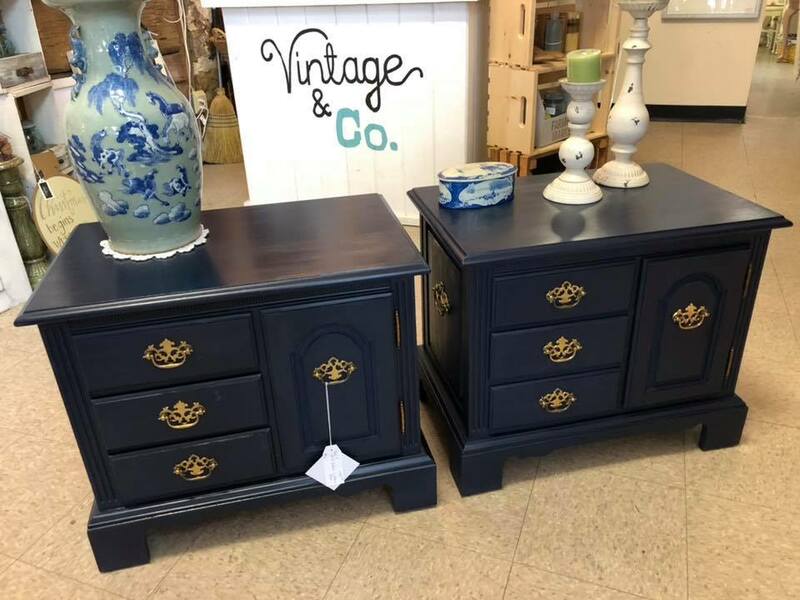 This pair of end tables can also double as nightstands. 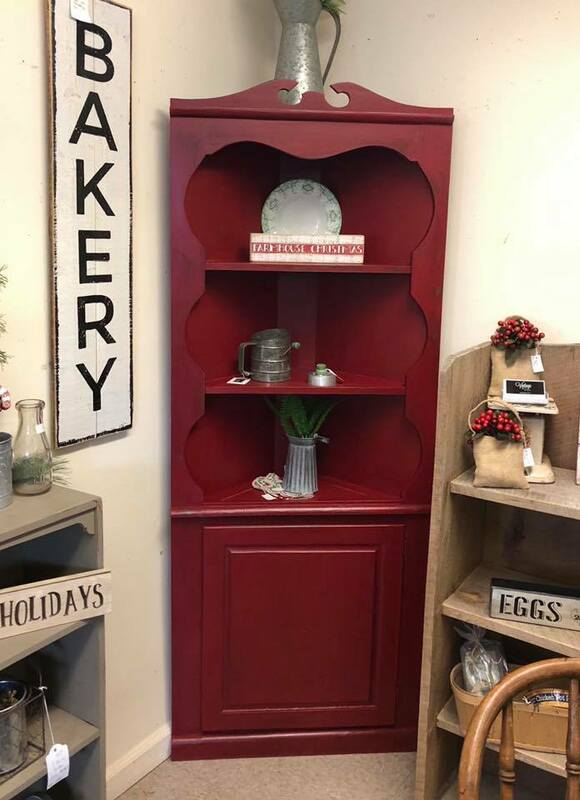 This vintage china cabinet was given a total transformation. The doors were removed, a barn wood panel was placed in the back. storage with three shelves plus a roomy drawer below. 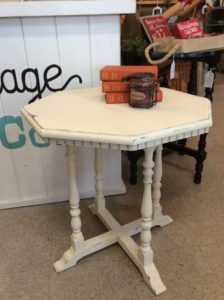 This is a unique industrial table in WHITE! to give it great character and appeal. 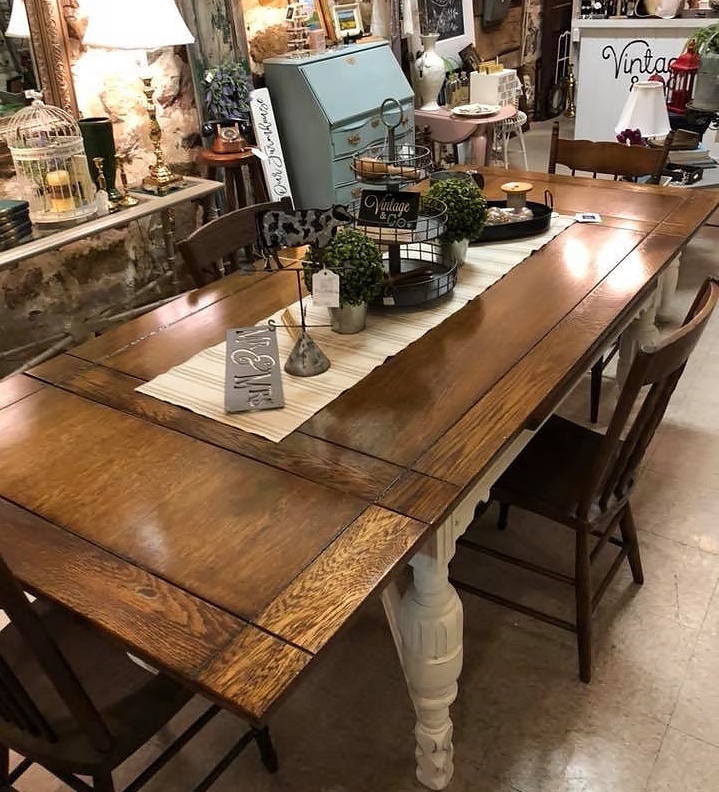 This is one of our best selling styles in Farmhouse tables and it is a beauty! The sides pull out and extend for extra seating. 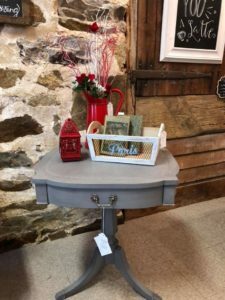 The base was painted using Country Chic Paint in Simplicity. 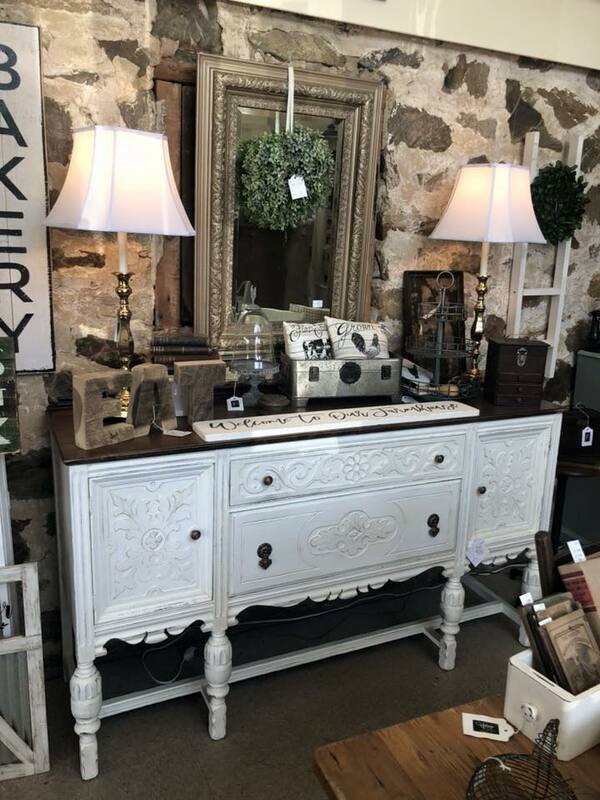 This Spanish Revival buffet is wonderful for pairing with a large dining table. the lower portion and stained and varnished on the top. 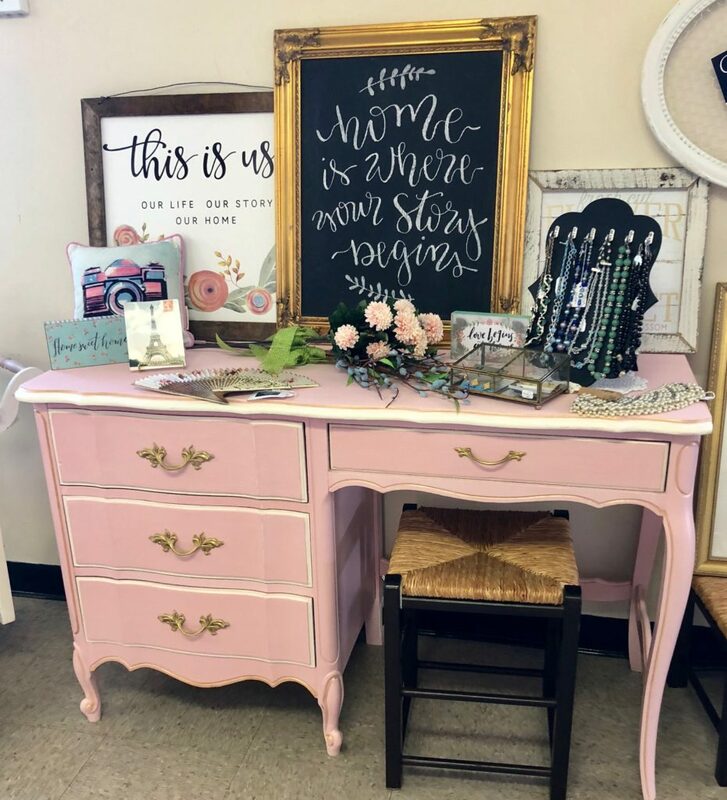 A vintage French Provincial desk or vanity was given a glamorous makeover! “Pocket Watch.” A young girl’s dream piece! We brought in this beautiful 12 drawer French Provincial dresser. 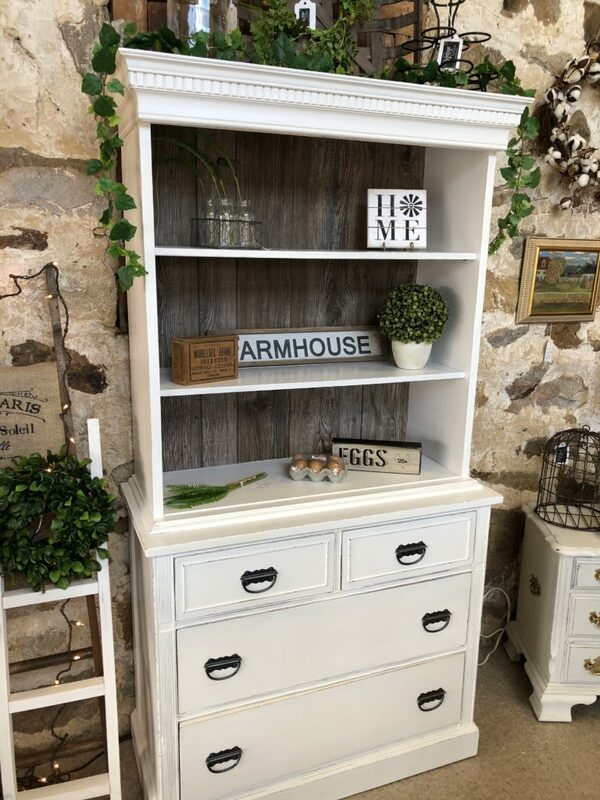 You will not be short on storage space with this lovely piece! Very well made and is in good condition. 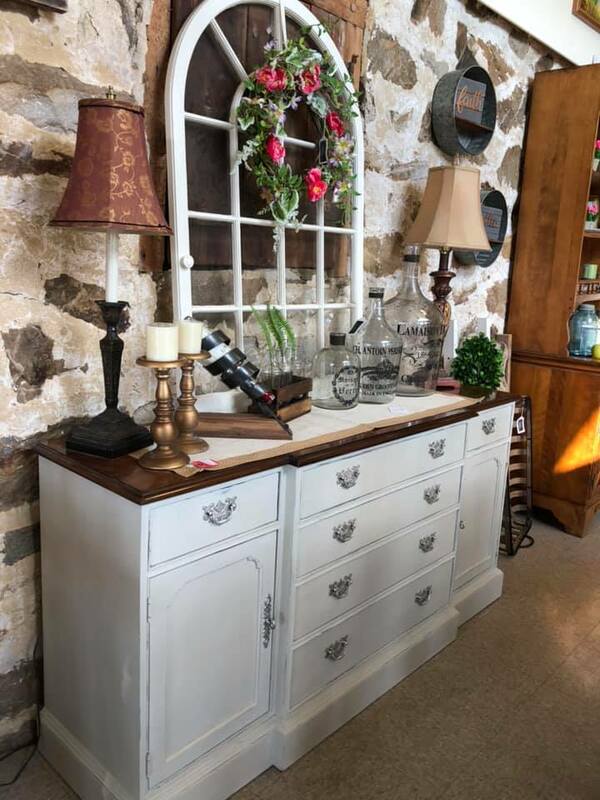 We have this gorgeous white farmhouse china hutch in the store! Love it! We used Country Chic Paint (clay based) in the color Simplicity. The main counter area was stripped and re-stained and varnished. 5 drawers and two lower cabinets provide lots of storage space! So elegant and classic. The gold hardware just pops! We used the Country Chic natural wax to give it a protective coating. The lid was stripped and re-stained, then varnished. 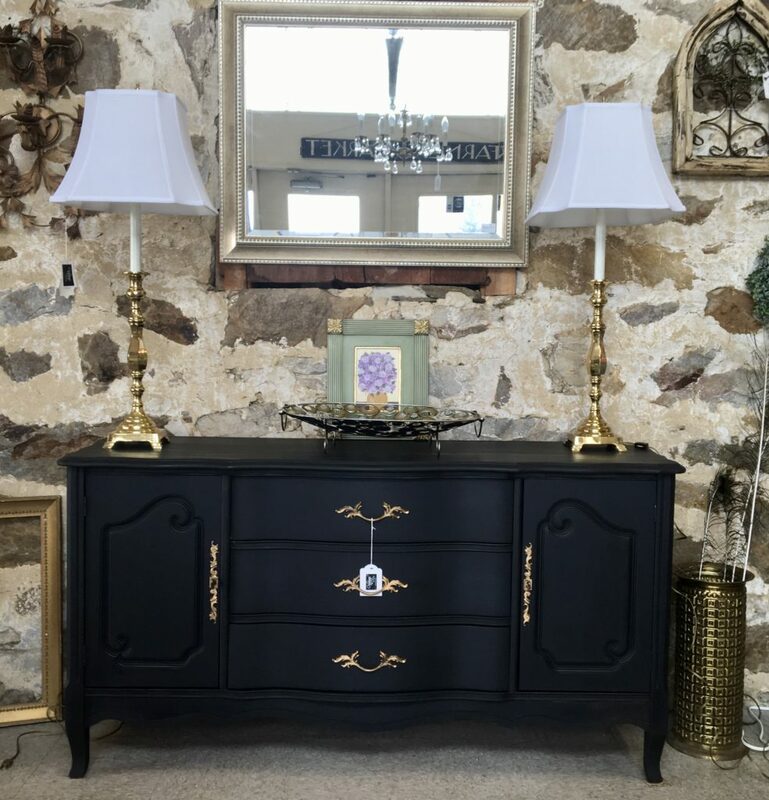 It measures 45″w x 19″d x 32″h and is $225.00. 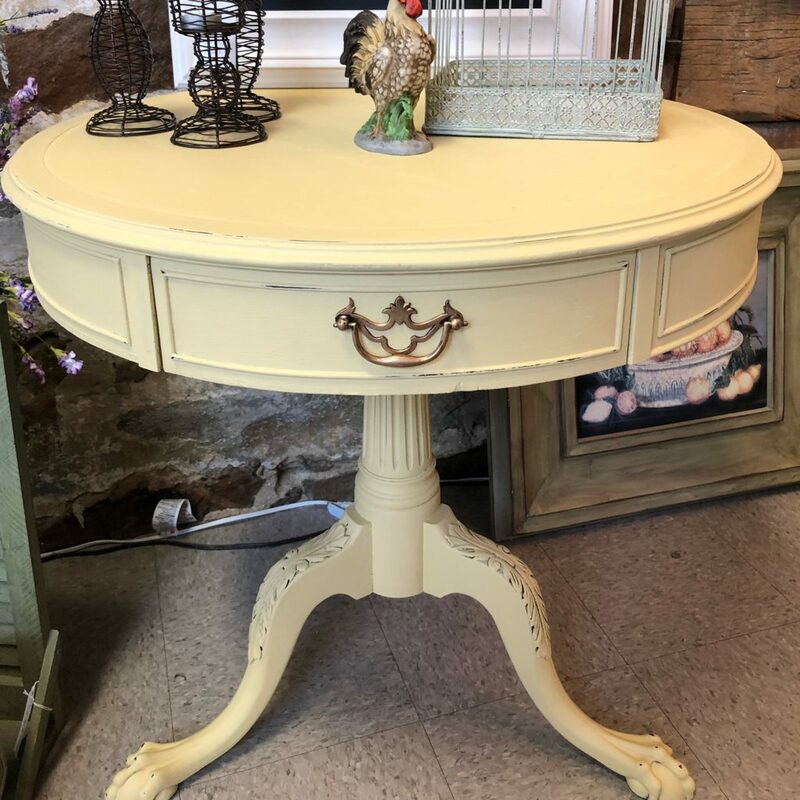 This sweet yellow pedestal table is a real gem! 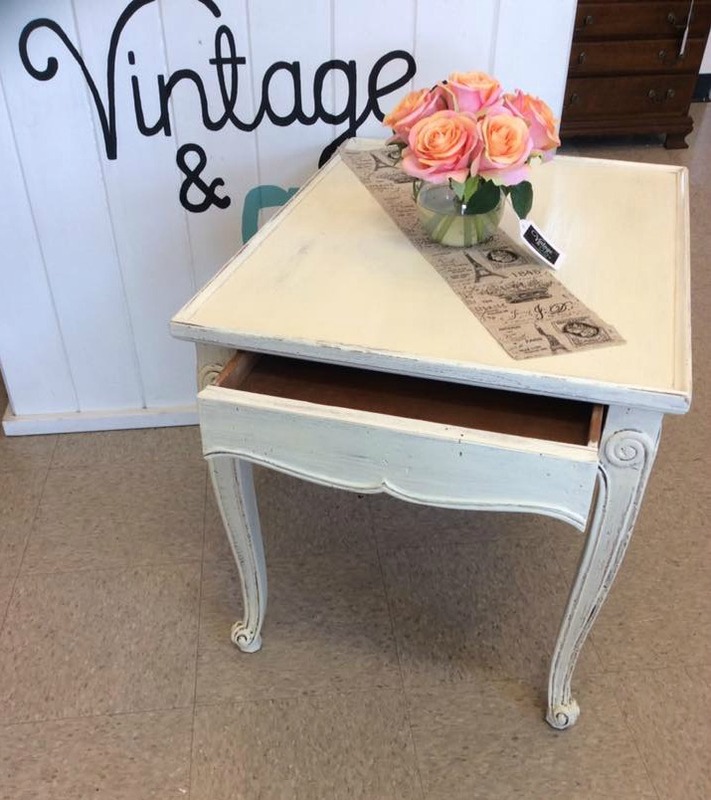 We painted it using Country Chic Paint in “Bee’s Knees.” Gave it a coating of their Natural Wax for protection. There is one drawer but has two “faux” drawers and hardware on the other side. 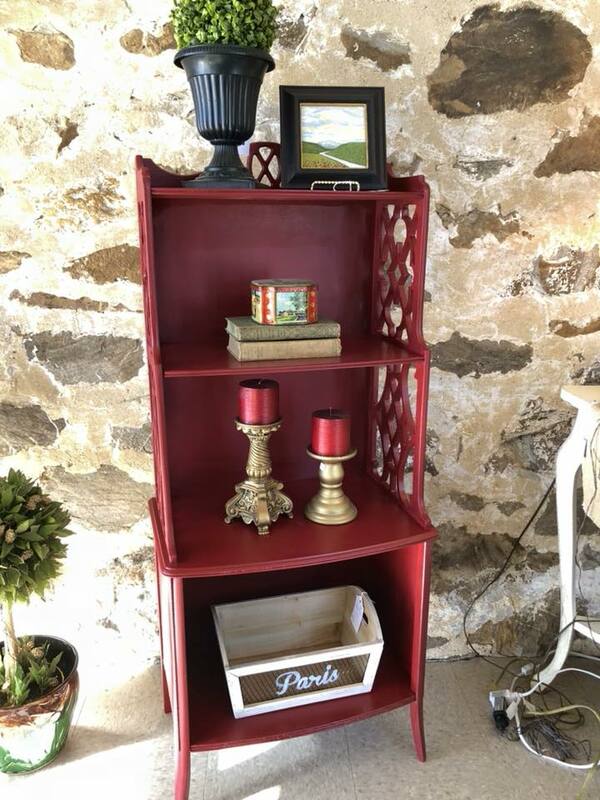 Country Chic Paint in Cranberry Sauce. great for using as a coffee or wine bar too! And speaking of coffee bars, this one lasted one day in the shop! 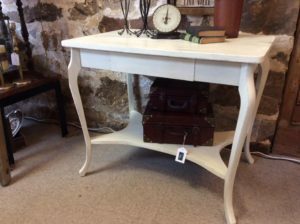 Also new in the shop is this wonderful Duncan & Phyfe pedestal table. I used Country Chic Paint in Pebble Beach with a grey wax. The gray wax gave it a beautiful velvety looking texture. This paint is so easy to distress and the wax goes on so smoothly! 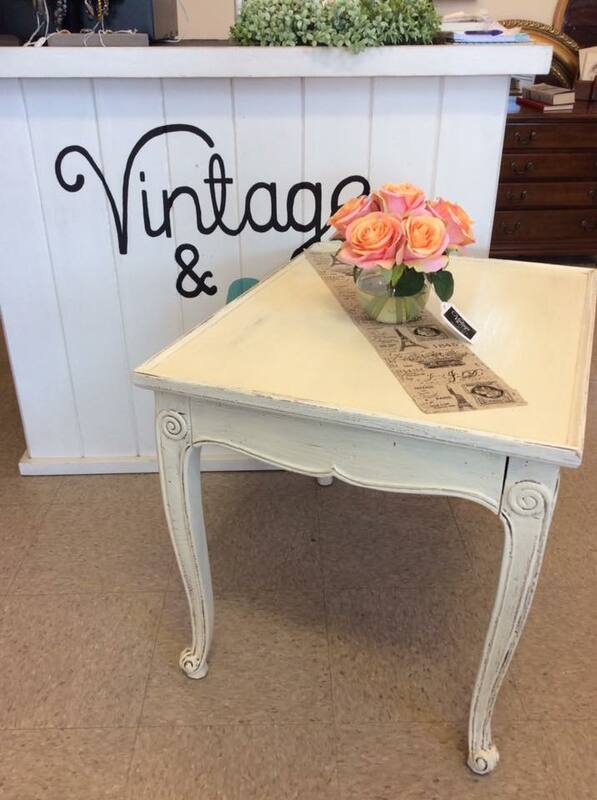 Add this side or lamp table to your decor for only $55.00! design. It also has a drawer to store remotes in or other essentials! 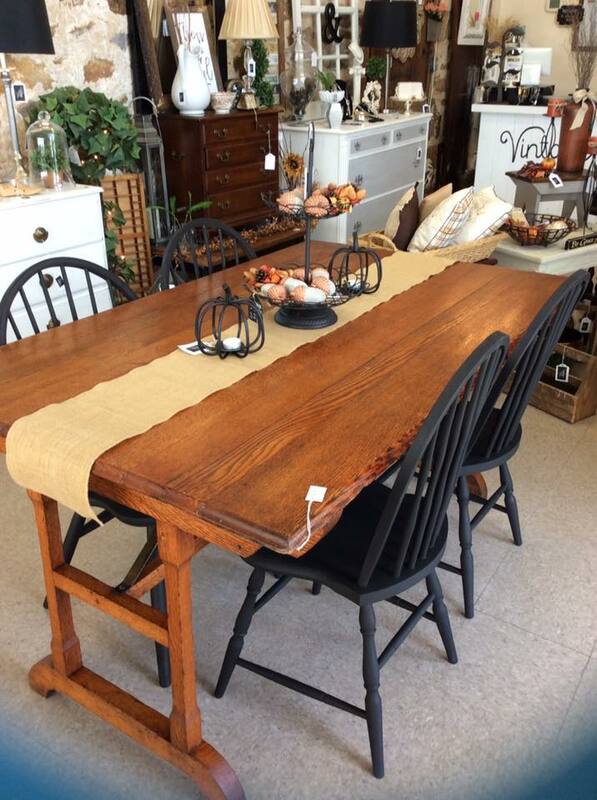 An antique farmhouse style dining table has arrived! It is 5 ft long x approx. 37″ wide. which give it a cool industrial feel. surface space! There are four black chairs to go with it. treatment was given to the drawer pulls. A must see! 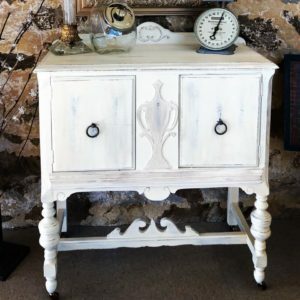 given a coat of cream chalk paint. It even has a drawer for holding remote controls or your latest magazine! Just $49.00 and is perfect for your neutral home décor. 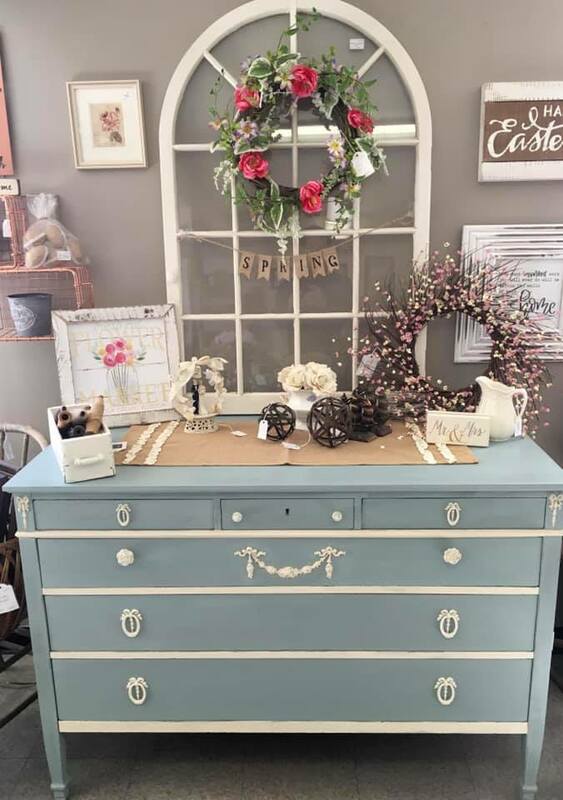 Check out this beautiful, two-tone dresser! 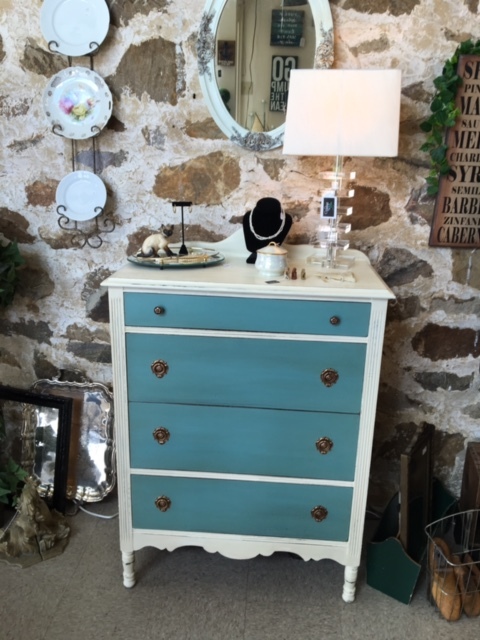 We used an aqua chalk paint paired with a pretty cream color. Special antiquey gold enhancements were added to the drawer pulls. Here’s a piece that is sure to brighten up any room! 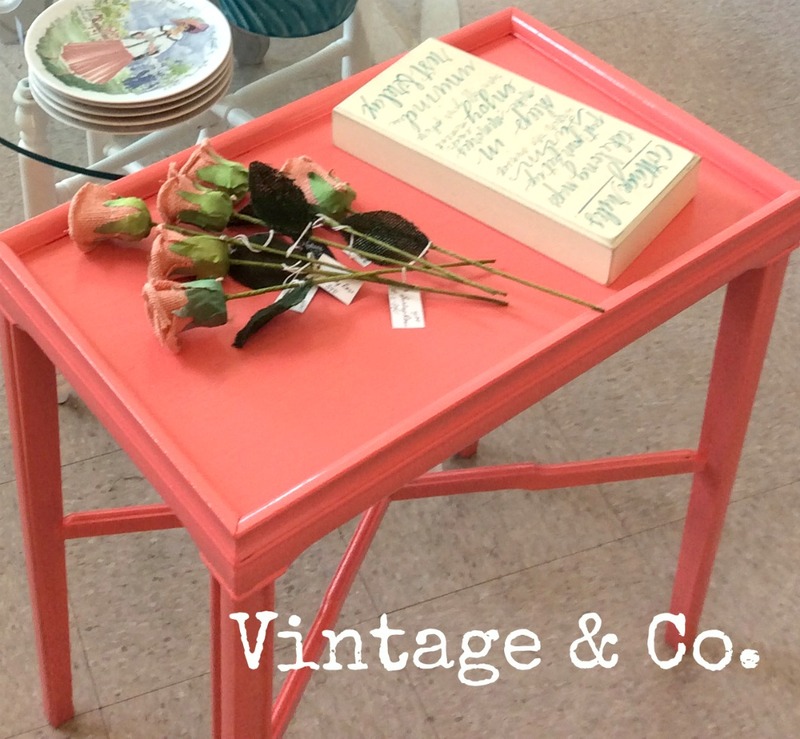 makes it a great nightstand or end table! 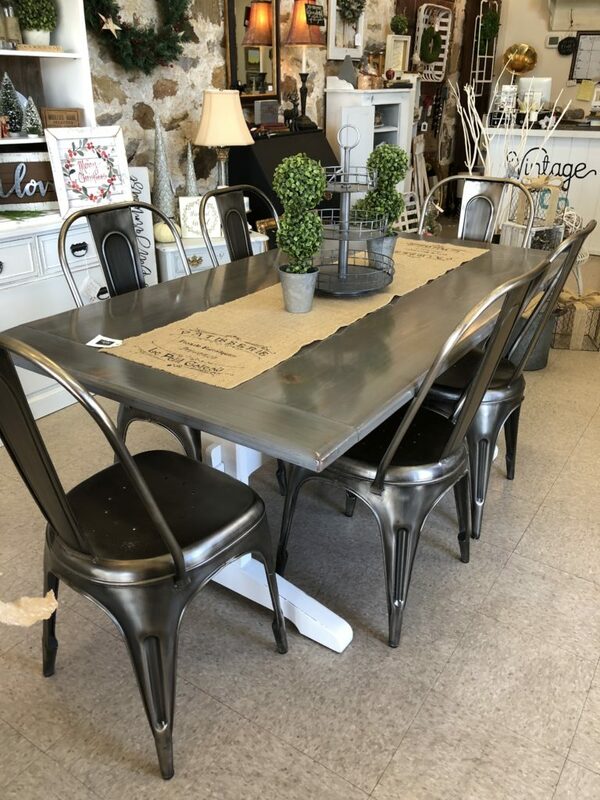 Another industrial piece for your living or family room! for organizing and displaying your stuff! has two shelves and three hooks! We also make a similar shelf out of reclaimed barn wood. areas in an “antiquey” bronze. We even have a vintage dress form or two. Fun to decorate with jewelry or vintage prize ribbons!